After the Big Alps-Loop of the summer of 2000, Werner, Lothar, Dietmar und I decided to have a closer look at Switzerland the following summer. As I tend to quite often spent time in Switzerland and know my way around, we’d already been to some of the more out-of-the-way places, the quieter backwaters which are barely known, but which nevertheless offer exceptionell scenery and challenging roads. The days target was Willerzell at Lake Sihlsee, of course NOT via the direct route. From Sonthofen via Altstädten and Fischen up the Riedbergpass (1420 m). Then past Hittisau to Großegg and Schwarzenberg. Towards Dornbirn it’s first up the Bödele (1003 m), the downhiller shows Lake Constance in the distance. Crossing the Swiss border via Dornbirn and Lustenau, it’s Altstätten next, the gateway into the Appenzell-area. This part of Switzerland consists of gentle hill-country, dotted with small villages....it all rather looks and feels like an outsized model-railway! Roads are superb, gently sweeping up and down. Via Oberegg to St. Anton, which (from the northern side) offers superb views across Lake Constance and down-valley views to Altstätten from the southern side. 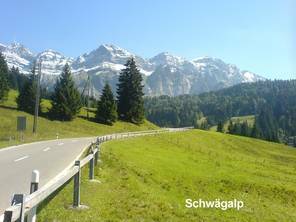 After the short stop it was across the Ruppenpass (1003 m) Appenzell and Urnäsch before the climb up to the Schwägalp (1278 m) at the foot of the Säntis Mountain. 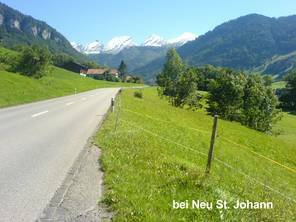 What a great road, it’s just about built for bike-riding....and things continue via Neu St. Johann and Wildhaus towards Liechtenstein. 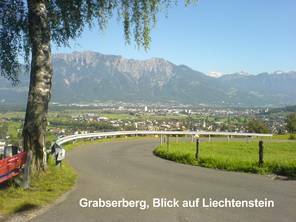 Liechtenstein came via Buchs and Schaan, the road then climbing from Vaduz to Malbun, a village in one of the furthest pockets of the tiny country. The sun put on a „light-show“, time for a quick photo-stop. Which included yours truly dropping the Pan European very gently onto it’s left side. Despite being a dead-end, Malbun is well worth the trip, the downhill stretch paralleling the climb. The map showed a tiny road from Mels via Portels to Flums, which somehow endet in a dead-end....doubling back, we finally found the right turn off towards Flums about halfway, a little gem of a road and decidedly preferrable to the main Sargans-Flums stretch. From Flums to Lake Walensee, a very scenic lake cradled by high mountains, and up to Kerenzerberg (743 m) which offers magnificent views across a picture-book landscape. Downhill to Näfels and towards Lake Zürich-See. 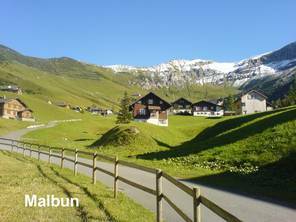 In Siebnen it’s a left-turn up the Sattelegg-Pass (1190 m) a delight for any 2-wheeler. The Camping area in Willerzell on Lake Sihlsee was the final stop.